Most of us know this situation all too well: spending another holiday alone because our soldier is away for training, duty, or deployment. Unfortunately, this next holiday stings the most, as couples plaster photos of their Valentine chocolates and flowers, fancy dinners, and unabashedly declare their love to each other all over social media. It's tough to escape it, and worse even then spending the holiday alone. Leave it to the JBLM Ladies Meet Up group on Facebook to turn what could be a lonely and sullen night into an evening of fun and friendship. The first Galentine's celebration began last year, Valentine's Day 2018, when military spouses Kaley Sherren and Hanna Smelser found themselves without their significant others on Valentine's Day. 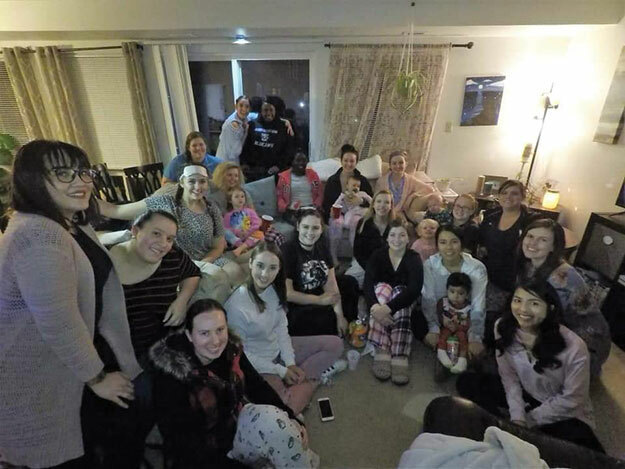 Having established the JBLM Ladies Meet Up Facebook page earlier in the fall, it quickly became apparent that many other spouses would be without Valentines as well. As usual, the girls' positive attitude and genuine desires to support the well-being of military spouses led to scheduling a meet-up they called, Galentine's. Hanna recalls the first event fondly, "We had a movie on in the background but we didn't really get to watch it because we were having too much fun socializing! We even all brought little homemade Valentines. It was a lot of fun, a lot of laughs." This time last year the group had just about 1,000 members, and had about 20 participants at the Galentine's event. While this was one of the largest turnouts at the time, it's now quite typical for the meet-ups to have at least that many people. The girls are expecting even more this year, and have reserved a larger space to accommodate over 40 people. As with most of the meet-ups and events, this one is also kid-friendly, to ensure the group is as inclusive as possible. The theme this year is a potluck Game Night, and to accommodate the number expected, multiple games will be taking place all night, with lots of delicious goodies to nibble on. The JBLM Ladies Meet Up group is a support network created for any female associated with JBLM -- spouses, daughters, mothers, soldiers, airmen, girlfriends and more. The importance of connecting with other females as soon as you arrive to JBLM is vital to the quality of life you experience here. Having this type of network, or even just one good friend, will increase your sense of belonging and overall happiness. During difficult times like deployments, these friendships reduce the stress of feeling alone and help cope with the burdens and responsibilities we take on while our spouses are away. The group is designed and managed so that anyone can create events to help find friends that share common interests, whether you are looking for a play date for your toddler, a shopping or workout buddy, or a group of fun girls to go out for drinks with -- someone is always up for something, even last minute. Kaley and Hanna encourage everyone to put the fear of being new aside, join JBLM Ladies Meet Up on Facebook and come to an event.